As a homeowner, it is easy to understand that you want it all for your home. The staff here at My Flooring America wants you to have it all. We want to be able to deliver you an affordable flooring option that has the exact look you want and is durable enough to handle all of the wear and tear in your home. All of this is truly possible with luxury vinyl tile in Webster, TX. This amazingly resilient flooring allows us to deliver you low prices, a great selection, a long lifespan, exceptional strength, and easy maintenance all in one package. There are few flooring options that touch luxury vinyl floor tile or planks when it comes to giving you the total package. Stop by our showroom today to begin browsing our selection and to learn more about why luxury vinyl plank and tile flooring is the right option for any space in your home. It is time for you to discover everything that luxury vinyl tile has to offer you by coming down to our showroom and checking out our selection and prices. While carpet, wood, stone, and laminate can all be commendable options for your home, why pay more for the others when you can save money and get many of the same great looks by choosing cost-effective vinyl tile or planks? Since vinyl tile is manufactured, there is no end to the possibilities it offers in terms of style, color, and selection. When you begin searching through our showroom, you are going to start discovering luxury vinyl tile that resembles ceramic, stone, and even wood. These luxury vinyl tile options appear just as detailed as in a picture, which means any style you choose will look good in your home and not chintzy. At our showroom, we offer you colors that range from browns to pinks and from gray to neutrals. This truly allows you to explore all of the design ideas you have for your rooms. Our flooring design experts are happy to discuss your ideas with you so that we can find a color that matches your room to perfection. 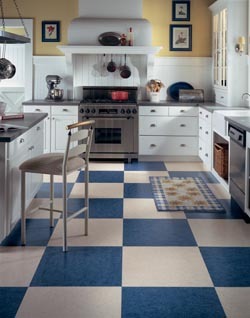 Luxury vinyl tile flooring is expected to be highly durable and very resilient. It is a flooring option that must be able to stand up to the demands of daily living. When you choose to have this type of flooring installed into your home, you need to have confidence that it will act as a protective layer to your floor and that it will resist scratches and tears throughout its lifespan. As a vinyl tile floor owner, you should also expect a floor that resists water and staining. It should be a floor that you can have installed in any room of your house, even the kitchen and bathroom, without fear of reducing its lifespan. The luxury vinyl tile available from our showroom, for example, is known to be so strong that it is recommended for not only residential properties, but also for commercial use as well. Luxury vinyl flooring is easy to keep clean thanks to its stain resistant properties. With any spill, just wipe or mop it up. During your weekly house cleaning, use a damp mop with a cleaning product that is recommended by the manufacturer. Another option is to use a couple of capfuls of clear ammonia in a gallon of water. Too much cleaner can dull the shine of your floor. You can enjoy all of these benefits from your new floor by having it professionally installed by our luxury vinyl tile installation team. Improper installation can end up reducing the effectiveness of your new floor, which means you might end up dealing with problems you shouldn’t have to deal with. So when you buy your luxury vinyl tile, make sure you are working with a trained professional, like those at our showroom, to ensure you are getting the best results from your new floor. The look of luxury vinyl tile isn’t where the benefits stop. For vinyl tile to be a good investment, it must be able to last a long time in your home while standing up to regular wear and tear. Fortunately for you, our tile has a lifespan of about 20 years, which means you can rest easy knowing your new floor is going to last. We rate all of our luxury vinyl planks and tile on performance, which includes lifespan as well as resistance to staining and fading. All of our luxury vinyl flooring rates at either a 4 or 5, with 5 being the absolute best of the best. Furthermore, all of your flooring purchases with us come with a Flooring America Ultimate Confidence warranty to ensure your continued satisfaction with our products and services. Call us today to select luxury vinyl tile and planks that meet all of your needs. We proudly serve Webster, Clear Lake, Houston, Nassau Bay, and Pasadena, Texas, as well as the surrounding areas.